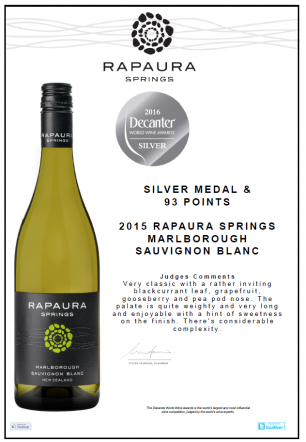 The Rapaura Springs Sauvignon Blanc 2015 has scored 93 Points and won a Silver Medal at the Decanter World Wine Awards 2016. Very classic with a rather inviting blackcurrant leaf, grapefruit, gooseberry and pea pod nose. The palate is quite weighty and very long and enjoyable with a hint of sweetness on the finish. There’s considerable complexity. Rapaura Springs was voted the New Zealand Wine Producer of the Year by the IWSC, and their 2015 Sauvignon Blanc was also awarded the prestigious “Champion Sauvignon Blanc Award” in the very same competition. The Rapaura Springs Sauvignon Blanc 2015 was fermented at cool temperatures to retain the pure fruit flavours from the vineyard. The wine is a classic representation of New Zealand Sauvignon Blanc, with a broad range of expressive flavours typical of the Marlborough region. Contact Christine to find out more.